A screenshot from newly unsealed video of the Mario Woods shooting. Newly unsealed video of the 2015 San Francisco police shooting of Mario Woods casts doubt on officers' statements about the deadly encounter, a federal judge said in a Tuesday ruling. U.S. District Court Judge William Orrick ordered that a lawsuit by Woods' mother can proceed to trial. 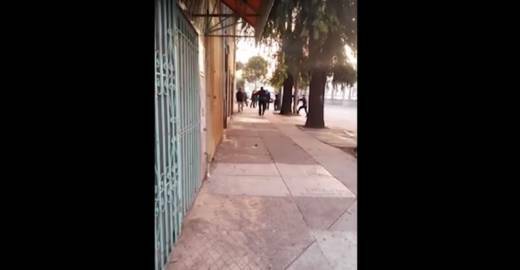 The video obtained by KQED was taken by a former Muni bus driver on Dec. 2, 2015. 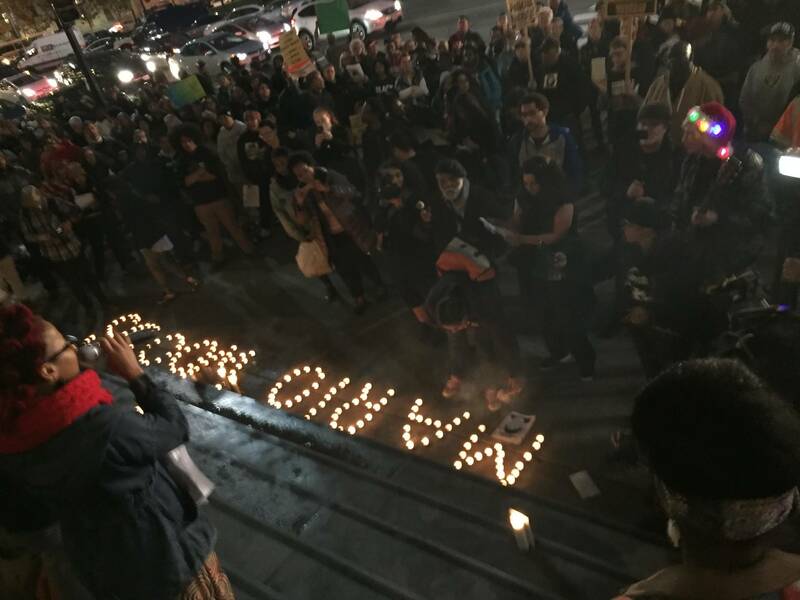 It sheds new light on several aspects of the shooting that contributed to launching an era of turmoil and reform for the San Francisco Police Department. 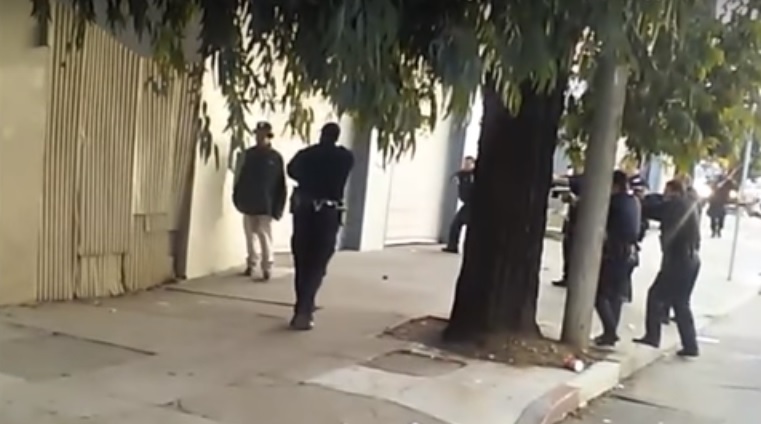 The footage begins just over a minute before five SFPD officers opened fire on Woods, shooting him 21 times. Officer Brandon Thompson can be heard on the recording telling his partner, Officer Charles August, to back away from Woods as both officers trail him onto Keith Street, near the intersection of 3rd Street and Fitzgerald Avenue in the Bayview district. Thompson and August had approached Woods several minutes before the video's beginning, suspecting him of a stabbing earlier that afternoon. According to August's deposition testimony, Woods was holding a knife and told the officers he wasn't going with them. More officers arrived quickly and can be seen on the video surrounding Woods in a semi-circle while his back is to a wall on Keith Street. The video shows Woods fall at one point as officers fired rubber projectiles at him. "Videos show that the less lethal rounds caused Woods to drop to the ground on all fours," Judge William Orrick wrote in his ruling, citing the bus driver's video. "After seven seconds on all fours and then his knees, he stood up." Orrick noted several of the officers' accounts in depositions and official statements after the shooting that said Woods then began to walk quickly toward August after the officer side-stepped into his path. "Videos cast doubt on the [o]fficer accounts that Woods was moving quickly or speeding up when officers shot him. They seem to show him take four slow steps with his right shoulder up against the building, walking with a heavy limp," Orrick wrote, citing the bus driver's footage. "The knife was in Woods's right hand, on the building side." The newly unsealed video provides perhaps the clearest view of the moment that August as well as officers Nicholas Cuevas, Winson Seto, Antonio Santos and Scott Phillips started to fire. It appears to show more space between August and Woods at the moment gunshots are heard, compared to videos from other perspectives. And, according to attorneys representing Woods' mother, Gwendolyn Woods, it shows Woods start to move away from August just before he's shot. The video appears to definitively disprove statements then Police Chief Greg Suhr made days after the shooting: that Woods raised a knife toward August before the officers fired. But neither Suhr nor anyone else investigating the shooting were aware of the bus driver's video until more than a year later. The driver said in deposition testimony that he feared repercussions and kept the video to himself until the summer of 2017, when he provided a copy to the city. The city attorney's office waited as long as it could to turn the video over to plaintiffs' attorneys, according to depositions in the case, because the Muni operator who recorded the shooting wanted to change jobs and no longer drive a bus in the Bayview district before his footage became public. Orrick dismissed parts of the lawsuit that relied on federal law, citing the relatively recent U.S. Supreme Court's decision in Kisela v. Hughes — a seminal case that expanded police officers' legal immunity when confronting suspects carrying knives. But the judge ruled a jury should have the final say on state-law based negligence and wrongful death claims. 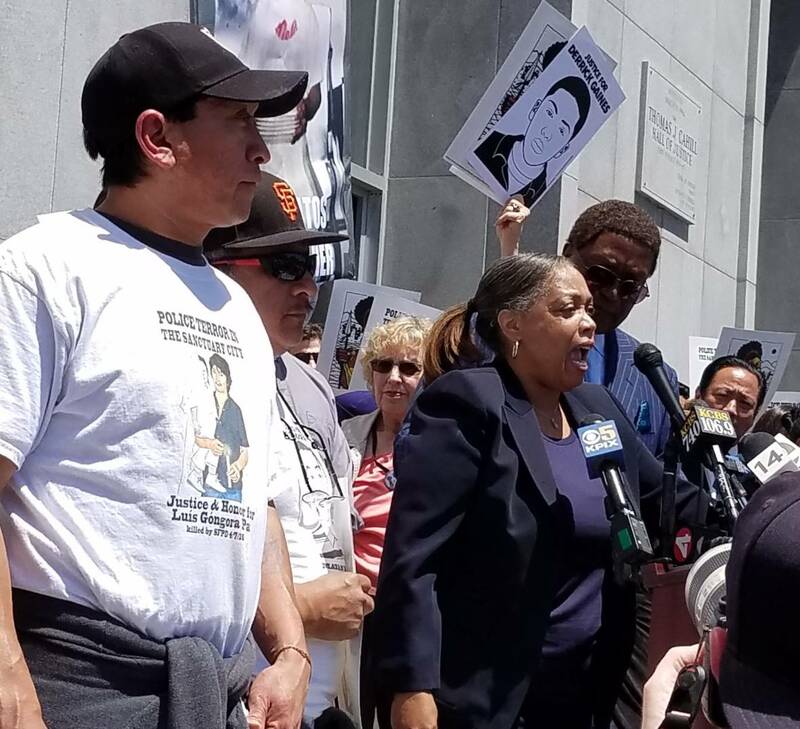 "Viewing the evidence in the light most favorable to the plaintiff, a jury could conclude that officers should have attempted more alternatives before shooting Woods," Orrick wrote. "Unique to this case, there were well over a dozen officers on scene, with at least nine in the direct vicinity of Woods. Each officer had multiple additional weapons, including wooden batons. Given Woods's size, 5'9" and 156 pounds, a reasonable jury could find that police could and should have overpowered him rather than killing him," the judge wrote. The city had sought a ruling that would find the shooting a reasonable, legally justified use of force before the case ever made it to trial. "Videos show that officers significantly outnumbered Woods, who had neither brandished the knife nor made verbal threats, but rather made statements a fact finder could infer were suicidal," Orrick wrote. "A jury could find that Woods was injured and moving slowly at the moment officers shot him. These facts could be sufficient to allow a jury to conclude that by escalating to deadly force in such a situation, officers acted with reckless disregard for Woods' rights," the judge wrote. Orrick noted the city's arguments that could show the officers' use of force "was tied to legitimate concerns about the safety of officers and bystanders." "This is a question properly resolved by a jury," he wrote. The trial is scheduled for April 1, 2019. Editor's note: The video below contains profanity and graphic violence. It may be disturbing to watch.